Sophie Bangs is a college student in a present-day New York in an universe where the world is completely dominated by science. There are flying cars and high tech buildings, cutting edge medical treatments, and fiction and myth are things of the past, relegated to academical studies. Sophie is interested in a mysterious character named Promethea, who keeps appearing at different and seemingly unrelated times in history. 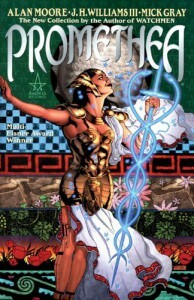 Soon, her research gets her closer to the physical embodiment of Promethea, and she discovers that she is the next person to channel the power of Imagination. This was recommended to me by a friend who is usually spot on about books that I will like. Sure enough, I wasn't disappointed. The exploration of imagination and dreams, communication and stories as the next stage in the evolution of the human beings, was extremely interesting. I loved the humor in his portrayal of modern society in all its absurdity. The artwork was fantastic as well, with the paneling artfully depicting the narrative and the "parallel" worlds. Looking forward to the next installment of the series.